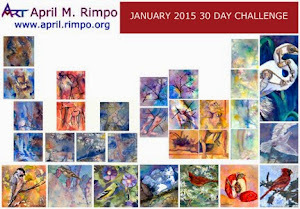 I'm often asked where I get my inspirations for my paintings and whether I ever struggle with what to paint. Ideas for paintings have never been a problem for me because I am so fascinated by the world around me. Landscapes, Cityscapes, and figures captured during everyday observation help tell the story of a place. I have learned that I love sharing these stories. Even if you see a very different story in my painting, that is great too. My story may have been my inspiration, but your story is what really matters. Recently I became aware of Jen Reviews' blog that includes the 100 Best Things to Do in Maryland. Reading the list I thought the places I've visited might be an interesting example of the variety of places that compel me to paint. Don't miss the link to Jen Reviews' link near the end of this post. Some have been as far away as New Zealand, Guatemala, France, Norway, and others right here in Maryland, where I live. 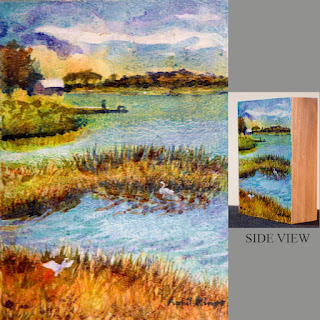 My little painting on Aquabord, titled Egrets' Haven was inspired by a visit to, Assateague State Park, which is quite close to Ocean City, Maryland. You've likely hear of Assateague because of the wild horses that live there. I was lucky to get photographs of the horses while there and am sure that one of these days they will appear in a painting. 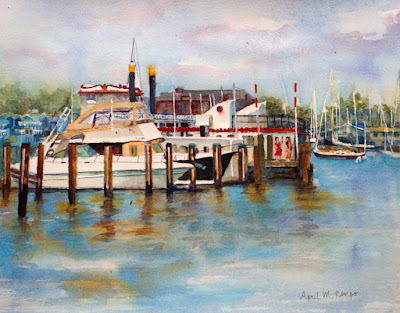 Even this painting of the Colombian tall ship, Gloria, was inspired here in Maryland at the Baltimore Inner Harbor, during Sailibration, an event held annually to commemorate the War of 1812. More than 40 tall ships visit the Inner Harbor to participate in the celebration. In the lower left of this painting, near the bow of the ship, you get a sense of the crowds that come to visit these beautiful ships each year. 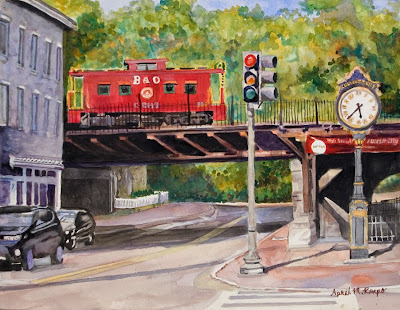 Historic Ellicott City, sometimes called simply Old Ellicott City, is a quaint town that preserves its history down to the color of paint used on the buildings in town. 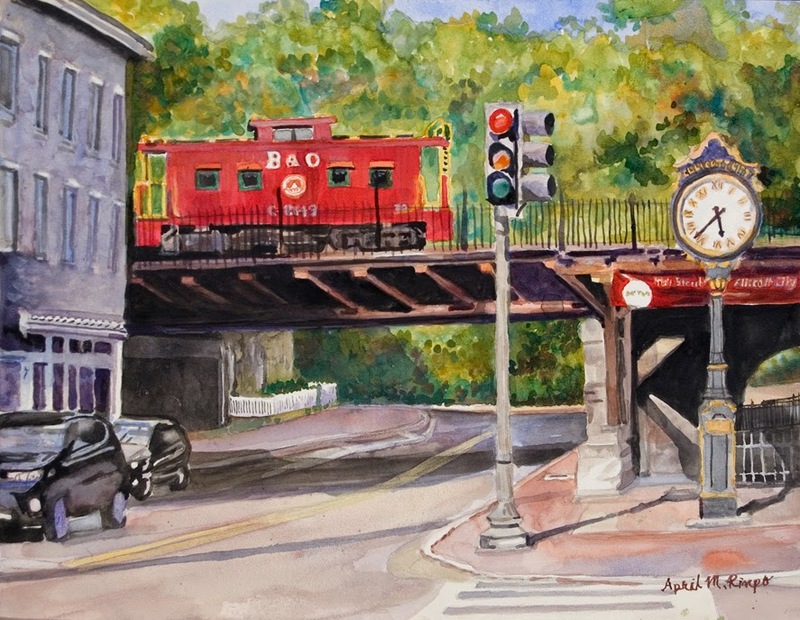 This painting is a view down Main Street showing the clock by the Train Station Museum, where a B & O caboose is on display. The real caboose no longer rides the rails, but it seemed only fitting to transport it back in history. A little over 20 miles from Ellicott City is the Brighton Dam Azalea Garden in Brookeville, MD 20833. 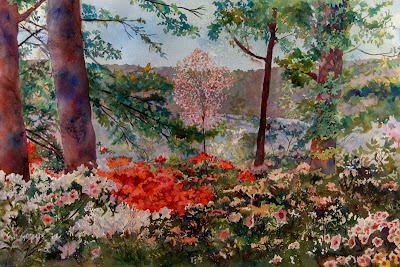 Nestled on a hill adjacent to a reservoir is this garden that comes to life each Spring, just in time for Mother's Day. I visit it every few years to capture the gorgeous blooms in a wide variety of color. 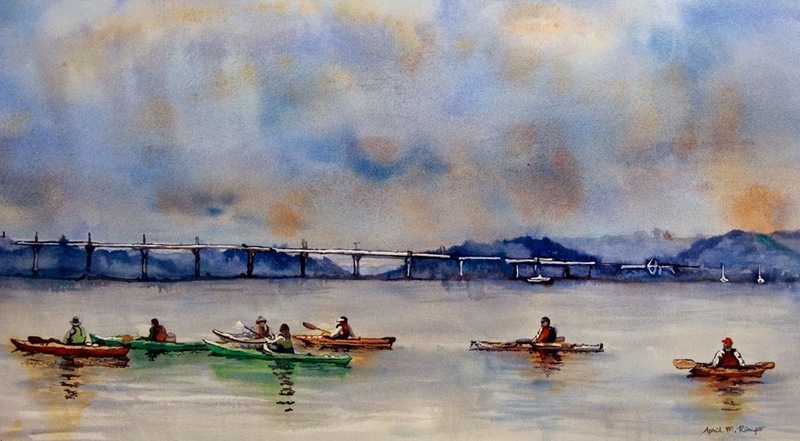 Traveling toward Annapolis, the capital of Maryland, you come across many waterways and small parks where you can sit and relax or meet up with friends to kayak on the river. 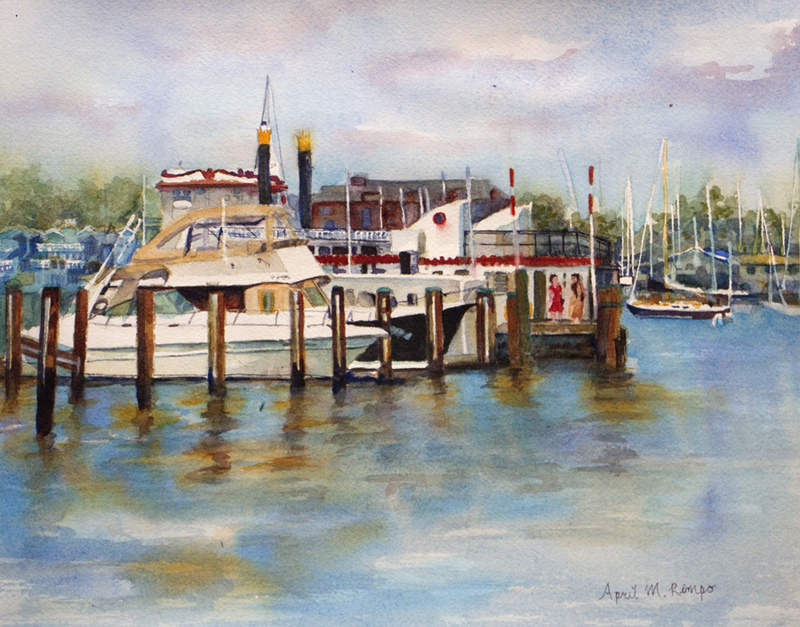 Summer Breezes is inspired by the Annapolis City Dock, which is located near the Annapolis capitol building and not far from the Naval Academy. As the name implies, this is a nice place to sit on a bench to relax and take in the sights. I hope you enjoyed this small tour, through my eyes and art, of just a few of the places you can visit in Maryland. If you are interested in learning about more places to visit, take a look at this Jen Reviews article, 100 Best Things to Do in Maryland. I've only been to a few of these locations, but agree they deserve to be included. This list now has me intrigued to explore other regions of Maryland to check out more places to see and enjoy; and just maybe paint.